• To make it easier for parents to decide what children will wear to school each day and to reduce peer pressure for expensive clothing. The wearing of jewellery is not permitted in the interest of safety and hygiene. A wrist watch may be worn and students who have their ears pierced are permitted to wear one small, plain stud in each ear. No other jewellery is permitted, including facial / tongue studs. Religious and cultural dispensations must be approved by the Principal. It is advisable that all items of school clothing and shoes be clearly named. This deters stealing and found clothing can easily be returned to the owner. During Term 1 and Term 4, students who are outside must wear the school hat. This includes sports practices and lunchtime activities. Students without a hat will not be permitted to participate in activities in the sun. Navy / grey polo with Te Puke Intermediate logo. Navy / grey polar fleece with Te Puke Intermediate logo. Navy / grey polar lined water resistant jacket. Blue, black or brown roman sandals worn without socks and no adornments. OR Plain black leather school shoes. House coloured polo shirts with house logo on the front and back. Navy sport short with Te Puke Intermediate logo. 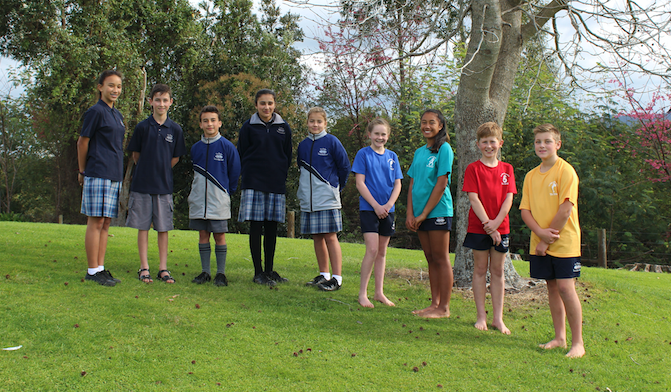 PE uniform can only be purchased through our uniform store. Navy hat or cap with school logo. Sunglasses may be worn outside with the school hat only. Grey elasticated cargo shorts with school logo. Grey knee length turnover socks with double navy bands. Blue / grey tartan double inverted pleat worn at knee length. Plain white turnover top ankle socks or plain black tights 50 – 150 denier. (Worn with no socks). During Terms 2 and 3 students may wear plain black track pants to and from school.